If there is one thing that can stir horse people up, it’s a discussion on technique. I don’t care what discipline you are in, as soon as you start to discuss technique or method, opinions are strong, and dismissals frequent. It is true that some techniques or methods have little to recommend them. Anything that causes pain, undue stress (remember, all learning carries a certain level of stress), or long term damage should be at least questioned, and at best passed over. 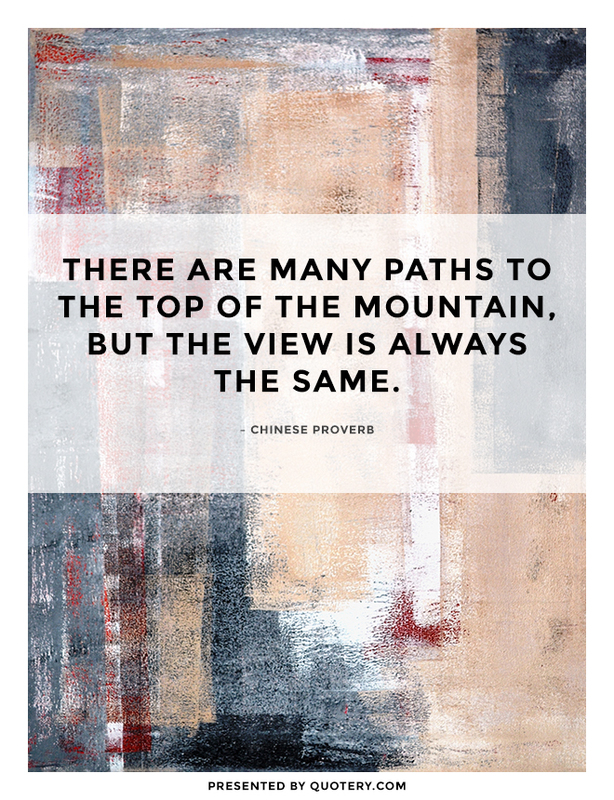 But, the reality is that there are many paths to take up the mountain – the issue is to ensure that you make it to the peak, and not just end up on a ledge, convincing yourself that it is the peak. To avoid that, you should focus on the principles of what you are doing – not the technique you use to get there. By now I am sure that I have riled a few folks, particularly those of the classical Dressage world. There is nothing so certain as a classical Dressage follower who has settled on a particular school, master, or technique to follow. I admire many of those people for the education they may have experienced at the hands of their master. But I have also encountered a certain amount of dogmatic tendency in that world – and I am as far from dogmatic as they come. What saddens me about some of those folks is that the very masters they strongly (and rightly) admire believed that they were in a lifelong learning curve that would only end upon their death. Nuno Oliveira, perhaps the most globally recognized master, was always in a state of experimentation. As long as you keep the horse always paramount in your consideration, they are tremendously forgiving of all experimentation. This page is from one of my favorite works, from a classically oriented master, focused on biomechanics. 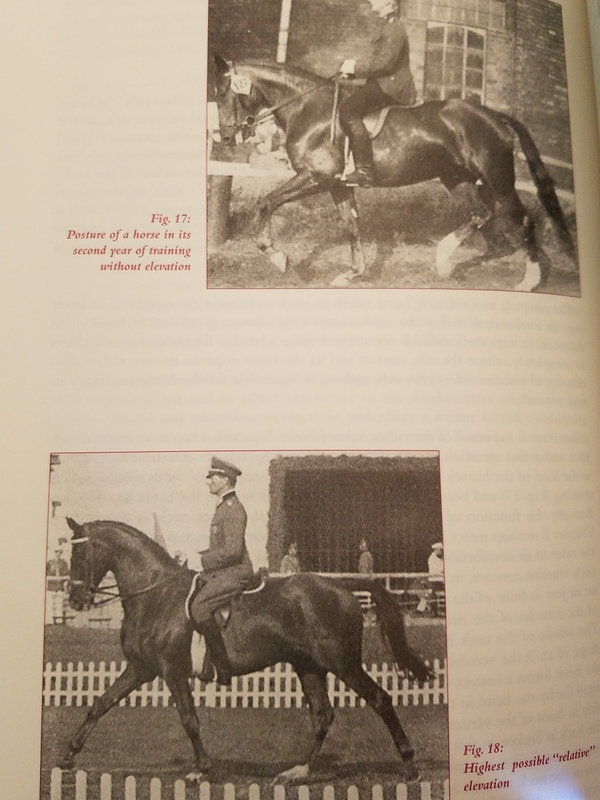 Many classical enthusiasts I know would judge the horse at top as on the forehand – yet that school obviously resulted in a stunning result, seen in the photo at bottom. The importance, when working with horses, should be placed upon principles that honor and understand their cognitive, emotional, and biomechanical functions. Real education and understanding of those principles will enable you to learn from the ultimate master of all things equestrian – the horse. As long as we use the horse as our guide, we can take from other humans what rings true for the horse – and leave those things that do not work. However, that something works for one horse, or one type of horse, is not proof that it is universally applicable. That is another frequent dogmatic tendency I see in horse people across disciplines – I have a technique that worked, so that is the technique that must be right; if it does not work on another horse, that must be due to a flaw in that horse. “I have found that the resistance in the hind leg has disappeared when the mobility of the jaw on the same side is activated. So who is right? Does engagement of the hind leg lead to loosening of the jaw? Or does loosening the jaw lead to more engagement of the hind leg? The truth is that either one can work. There are muscles that connect from the jaw into the trunk of the horse, connecting in turn to muscles that help govern the movement of the hind legs. So, loosening one end of that chain has a reciprocal affect on the other end of the chain. This is where understanding the biomechanics in action can help you understand the validity of a given technique. However, there are other considerations in dealing with a given horse that may dictate one of these approaches as preferable over the other. 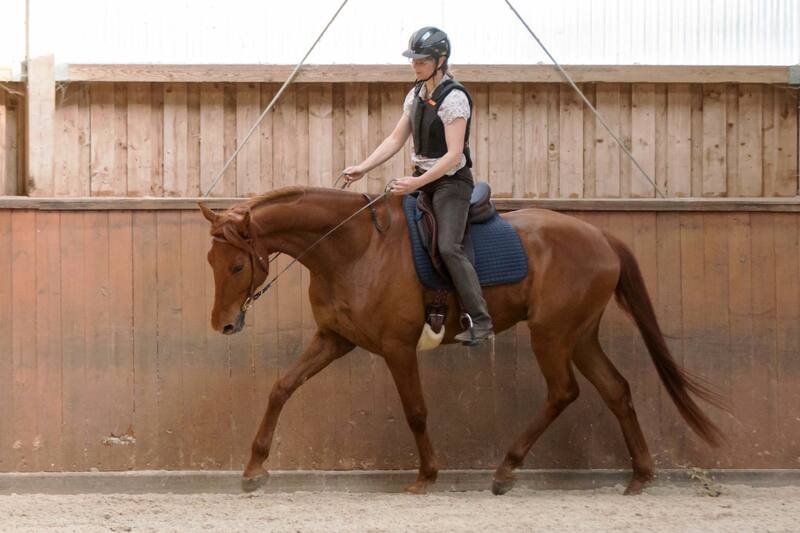 Continuing my argument with this particular example, I have used both techniques – mobilizing the hind leg for addressing resistance I feel in the front end; and mobilizing the jaw for resistance I feel behind the saddle. Nash, after six years of life as a race horse, was very good at bearing into any contact in the bridle – bracing not just his jaw, but the muscles in the upper part of his neck, and various places in his trunk. The bracing in his trunk made any mobilization of his hind leg very challenging. It was only when I spent some time working on mobilizing his jaw that I finally achieved enough “give” in his body that I could address his hindquarters. This is not to say that I couldn’t have achieved the same result by only addressing his hindquarters and trunk – but it caused more “argument” from him, so the path I took was the one of literally least resistance. I had a similar experience with another ex-racehorse; but this same approach is problematic for other horses. Coffee was started with an approach that was meant for him to duck behind any contact given. As a Western Pleasure horse, he was to go on zero contact – so all contact taken was meant to essentially be aversive enough to cause him to back away from it. If I take the approach of attempting to mobilize his jaw, I will simply cause him to revert to that first method. So, my approach with him has been to get him as open, and eventually up, as I can. Now that he is pretty solid in that, I am still staying away from using reins – old habits rear their heads frequently. But, on my last ride, I worked on exercises that targeted mobilization and engagement of his hind leg – and low and behold, in the moments where I felt the hind leg step under and take more load, he started softly mouthing the bit! So, both approaches are valid – with the caveat that you have to understand not only the biomechanical goal of the approach you choose, but the affect that technique might have on an individual horse. I have experimented with mobilizing Tally’s jaw – but due to the abuse her mouth suffered, it resulted only in an escalation of emotion. I will be taking the same approach with her as with Coffee. For me, personally, that is my preferred method, as I try to do as little with the mouth as I possibly can get away with. However, I am glad that I have learned the other technique, for the times that it has served me well. 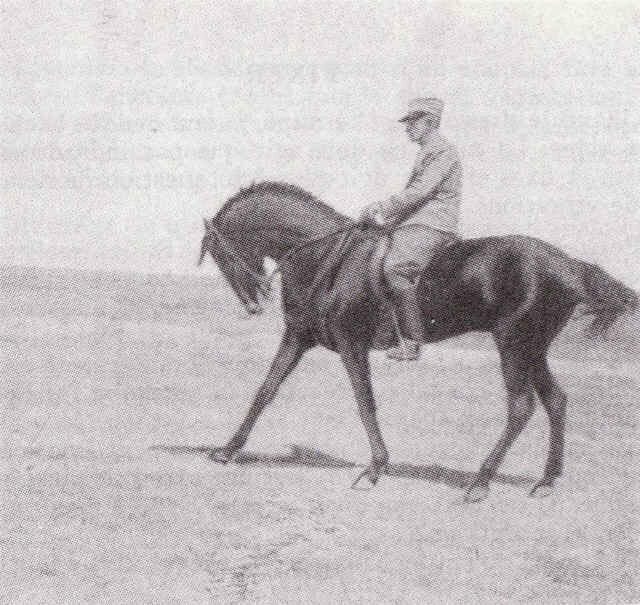 A recent debate of this, and similar photos, stirred up some classical followers, stating this horse was on the forehand – yet some of us have found this a useful way to ride some horses, with no negative effect on the final “product”. Compare this to the top photo of the page illustrated above – which horse is more on the forehand? I try to be open to any technique that I see – judging first the emotional effect it is having on the horse. While all learning comes with an element of stress – for humans as well as horses – I do not want to see sustained or excess stress. Once I have judged that aspect, my next check is on the biomechanics – not how perfect they are, but first if they are causing either short or long term damage. If both stress and biomechanics are without harm, then I am at worst neutral on the method. I have no complaint about any method that leads to a happy and healthy horse. Whether or not I adopt any part of the technique would take a great deal of information, key of which is to see a long term result of where it takes the horse and rider. Unfortunately, we are in a period of divisiveness, and few can find any method acceptable that does not fit their very specific view of what is “correct”. I was recently reading an article on the state of the U.S. republic, and this quote struck me as being applicable here: “The people we spend time with day in and day out shape our tastes, our assumptions, and our values.” (“America is Not Democracy”, The Atlantic, March 2018) The reality for many riders is that they start with a trainer and stay either with that trainer or with their associates. They may ride in clinics – but often those are recommended by their trainer, so generally someone who teaches in the same vein. After a while, anything that sounds or looks different must, by definition, be wrong. Beudant in a moment that many of his present day admirers would criticize in another rider. As I stated earlier, the sad part of this stance is that most of the past masters looked closely at their peers – the more different, the more closely they appeared to look. Sometimes they became dismissive of what they saw (Steinbrecht is very clear on his disdain for Baucher), but more often they were respectful of the other’s craft. Being respectful, does not mean adopting the practice – something that works for one person may never be mastered by another. Beudant would be my favorite example of this. Many past masters point to him as a tremendous horseman, yet the photographic record that remains shows many things in his riding that I have not seen followed by many who admire him. In fact, many photos seem rather close to what those same followers abhor in others. That seems to do little to dampen their enthusiasm, if Beudant is in the DNA of the school they have followed. My veterinarian, an accomplished horsewoman in her own right, once said “Horses are truly amazing. No matter how you train them, or how badly, they somehow figure out how to do what you’re asking of them.” She’s right. Certainly there are better and worse ways to train horses, but as long as you have in mind the end result that you are after, the technique you use or the school you follow is far less important than paying attention to the horse’s feedback. Anyone who clearly puts the horse first is to be admired, in my book – whether I choose to follow them or not. This entry was posted in Classical Training and Philosophy, Thinking Out Loud and tagged Baucher, Beudant, Classical Dressage, classical equitation, Gustav Steinbrecht, hind leg engagement, jaw mobilization, Nuno Oliveira, riding dogma, riding technique. Bookmark the permalink.